At Regal uPVC we are fully committed to providing genuine straight forward advice - from first contact to handover. With the very latest computer aided design package, we'll walk you through every exciting possibility, finalise your ideal design, and translate your dreams into reality without the headaches and frustrations you might expect with any building project. We can even arrange the building and planning applications leaving you with nothing to do but relax and enjoy your new room. Total construction package - from concept through to completion. Elegant PVCu side frames are combined with interlocking aluminium alloy supports, delivering maximum strength. All roof components manufactured from top specification stainless & aluminium alloys. Design options to enable installation in the most difficult & unusal spaces. If you can dream it - we can build it ! 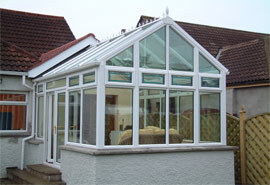 Internal glazing option with internal roof assembly for outstanding burglar defence. Integral heating & air conditioning systems available for maximum comfort. Full 10 year guarantee, from a trusted company, established upto 10 times longer than some of our so called "competition" . The SYNSEAL Conservatory system supplied and constructed by Regal uPVC has been rigorously tested by the BBA to ensure its durability over the next 25 years. 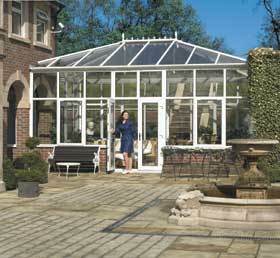 Beautiful lines, with an elegant facetted front recreate the style and luxury of the original period conservatory. A traditional design to compliment any home. This grand design gives great spacial flexibility and maximum floor area for your money. A great choice for everday rooms. The high roof, and imposing gable end give a great sense of height, grandeur and interior spaciousness. A truly beautiful, light filled space for the whole family to enjoy. 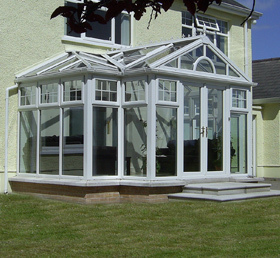 These conservatories offer good value for money and often permit installations where other styles are not practical. Similar floor area to both Edwardian & Regency styles. While each of our traditional conservatories make a beautiful addition to any home, there are those occassions when flexibilty, building layout or project stautus demand an extraordinary design in the form of a bespoke combination. Whether you require a large portal framed swimming pool enclosure or a multi-zoned living space, our design team and consultant engineers can produce a design to house it, for much less than you might think! The Synseal SHIELD roof system has been thourouhly tested by the BBA and is one of very few systems to have been awarded a BBA certificate.